My cake is a birthday cake that I made for someone. The cake is a vanilla and amaretto flavored cake. This is the first time I made this cake. When it was baked, I tempered it with amaretto and there was a little bit of that also in the cake itself. This cake design was also a first time for me. At first I did not know what it would become. I iced it first pink and then I wanted to make a basket weave on top but then I thought of this cake design and so that is what it turned out to be. 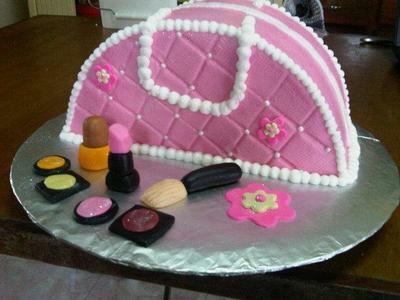 The flowers are made of gumpaste and the nail polish and lipstick and eye shadow were also made of gumpaste. It turned out to be a lovely cake after all and very delicious too. The birthday girl was very pleased with how the cake turned out.